Characteristics, History: Tallest Statues in China. For more about Buddhist sculpture in Asia, see: Asian Art (from 38,000 BCE). "Observing the Cries of the World". Buddhist religious art celebrates the life and ideology of one man, Siddhartha Gautama (died c.400 BCE), now worshipped as Buddha Shakyamuni. Widely commemorated in Chinese art, Buddhism has inspired countless types of sculpture, notably in monumental statue form, made from a wide variety of materials including gold, bronze, terracotta, jade, stone, ivory and wood. Indeed, images of Buddha are essential features of monasteries, temples and shrines, in both Theravada and Mahayana doctrines. The Mahayana tradition, in particular, has exerted a major influence on the culture of East Asia, especially on Korean art as well as Chinese and Japanese art. In China, Buddhism had a huge impact on the country's plastic art: indeed, without Buddhist inspiration, Chinese sculpture might have remained a comparatively minor art. As it is, Buddhist statuary ranks alongside jade carving and lacquerware, as well as Chinese porcelain, as one of China's most distinctive visual arts. Over the centuries, Buddhism extended its original focus on Buddha Shakyamuni to include a number of celestial Buddhas and bodhisattvas as well as other teachers and thinkers. While Buddhas are considered to have achieved a state of total spiritual enlightenment and to be entirely free of the phenomenal world, Bodhisattvas (meaning, individuals who are bound for enlightenment but who have not yet attained it) remain accessible to others. Buddhism was known in China by the 1st century BCE, and Buddhist monasteries with monks from India and Sri Lanka, who served as teachers and translators, were established in numerous locations across the country by the 2nd century. Early statuettes of Buddhas have been discovered in tombs dating back to the 2nd and 3rd century; however, production of Buddhist imagery did not become widespread in China until the 4th century, when a divided China, especially in the north, was often ruled by nonHan Chinese clans from Central Asia. As well as freestanding sculpture, images of Buddha were also carved in man-made cave-temples at sites such as Dunhuang, Yungang, and Longmen. Similar to those found in India and Central Asia, these cave-temples range from simple hollowed out chambers to enormous complexes with living quarters for monks and visitors. The evolution of Buddhist iconography during the six centuries from 350-950 was marked by the development of Chinese traditions such as Pure Land, which is centered on the Buddha Amitabha, the Bodhisattva Avalokiteshvara, and Chan (or Zen). Pure Land philosophy stresses devotion and faith as a means to enlightenment, while Chan promotes meditation and mindfulness in ordinary daily life: both these traditions also flourished in Korea and Japan. During the 9th century, new practices began to be introduced into China from India and Central Asia. They included worship of the celestial Buddha Vairocana, new images of bodhisattvas like Avalokiteshvara, and the appearance of cosmic diagrams such as "mandalas". Chinese Buddhist sculpture was significantly influenced by foreign models. Works with powerful physiques and thin clothing, for instance, derive from the painting and sculpture of India, while works that combine thin bodies with thick clothing belong to the Chinese tradition. Many Buddhas and bodhisattvas consist of a mixture of these visual types. When Buddhism disappeared from India, after the 11th and 12th centuries, Buddhist temples and monasteries in China, Korea, Japan, and the Himalayas, served as important centres for the ongoing development of Buddhist plastic art in all media. The arts of the Six Dynasties Period (220-618) featured increased demand for Buddhist bronze sculpture, as well as stonework with animal motifs. This paved the way for a sculptural renaissance during the era of Tang Dynasty art (618-906). Under the Tangs, as well as stone sculpture (see, for instance, The Leshan Giant Buddha), both bronze casting and ivory carving became popular. The basic stereotypes, however, continued to come from India, inspired by the art of the Gupta period. The Tang capital of Changan (present-day Xian) became an important centre for Chinese Buddhism, from where it spread to Korea, and Japan. After the late Tang Emperors suppressed Buddhism as a foreign ideology, in order to strengthen the indigenous religion of Taoism, Song Dynasty art (960-1279) witnessed a revival of Buddhist art, exemplified by the continued construction of monumental sculpture at Dazu in Sichuan province, and the the temple at Mingshan in Anyue, Sichuan province. Chan Buddhism, in particular, prospered for some centuries, with Chan monasteries becoming important centres of religious learning. Wood carving of Buddhas and bodhisattvas was also popular. NOTE: For an interesting comparison with South-East Asian Buddhist sculpture, see the numerous statues of Buddhas and Bodhisattvas at the 12th century Angkor Wat Khmer Temple (1115-45) in Cambodia, itself influenced by building designs imported from India - see, for instance the 11th century Kandariya Mahadeva Hindu Temple (1017-29) in Madhya Pradesh. Ming Dynasty art (1368-1644) also encouraged Buddhist works, notably in goldsmithing and other forms of decorative art. Some 2.5 million ounces of silver, for instance, were used in the ornamentation of the Buddhist "Porcelain Pagoda" in Nanjing. Buddhist sculpture during the period of Qing Dynasty art (1644-1911) continued to develop, particularly in the 18th century after Qing rulers agreed alliances with Tibet and Mongolia, which led to the construction of many Buddhist temples of the Tibetan school, in Beijing and elsewhere, and a huge increase in demand for Buddhist statuary, as exemplified by the statue of Lobsang Palden Yeshe (the 6th Panchen Lama) (1738-80, Field Museum, Chicago). The sculpture is adorned with cloisonné enamelling and goldwork. Most types of art fragmented in China during the 19th century and early 20th century, due to Western influences, political disturbances and war. The emergence in 1949 of the People's Republic of China, was followed by another stagnant period of Chinese painting and sculpture, which was dominated by socialist realism and other explicitly political themes. Although the politicization of the arts continues, Chinese leaders have authorized the construction of a number of monumental Buddha statues, several of which dwarf the dimensions of the 100-foot high Colossus of Rhodes (c.280 BCE), one of the Seven Wonders of the Ancient World. In summary, the historical development of Buddhism in China has given the country one of the richest collections of Buddhist visual art in the world, above all in the field of sculpture. China's most famous Buddhist sculptural sites include the Mogao Caves and the Bingling Temple caves in Gansu province, the Longmen Grottoes in Henan province, the Yungang Grottoes in Shanxi province, and the Dazu Rock Carvings near Chongqing city. 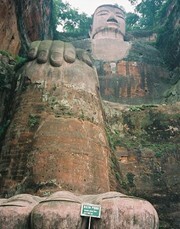 In addition, The Leshan Giant Buddha (begun 713) in Sichuan province, near the city of Leshan, remains the largest stone Buddha statue in the world. 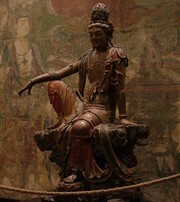 For the history and development of Buddhist sculpture in East Asia, see: Chinese Art Timeline (c.18,000 BCE - present). The tallest statue in the history of sculpture. Location: Zhaocun township of Lushan County, Henan. This statue of Bodhisattva Avalokitesvara is the world's 4th tallest statue. Location: South coast of China's island province Hainan. This gilded bronze statue of Avalokitesvara is the world's 7th tallest. This bronze Sakyamuni standing Buddha weighs over 700 tons. Location: South of the Longshan Mountain, Wuxi, Jiangsu Province. 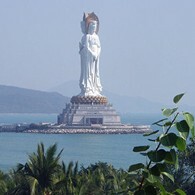 With its pedestal, this Bodhisattva stands 77 metres/253 ft high. Location: Mount Xiqiao, Foshan, Guangdong. A UNESCO World Heritage Site since 1996. This cliff-face statue of a seated Maitreya Buddha is the world's largest stone Buddha. It can accomodate a seated adult person on its tiniest toenail. Location: Confluence of the Minjiang, Dadu and Qingyi rivers, Sichuan. Location: Mountain carving, Wushan County, Gansu. Location: Emei Township, Hsinchu County Taiwan, ROC. Location: Lushan District, Jiangxi China. Location: Xishuangbanna Dai Autonomous Prefecture.  For more about carvings, bronze castings and other sculpture in China, see: Visual Arts Encyclopedia.